I haven’t been crafting much (besides the knitting I blogged about) but I have been attending craft fairs and purchasing locally-made goodies. First, there was Circle Craft Christmas Market at the new Vancouver Convention Centre West from November 17-21. I bought some tasty treats from Milsean Shoppe (that are already gone), some butter toffee from Sweet Truth, and some wine jelly from Lone Willow Enterprises. Read more about the drool-worthy Gourmet Alley on the Circle Craft blog (my post). I asked the artist at Illuminati how it was made so that I could explain to anyone who admired it. Basically, there are three ways to make glass — hot, fused, and cold. Hot glass is molten (like the glassblowing I did last year), cold is like stained glass, and fused is a medium-heat in an oven/kiln. 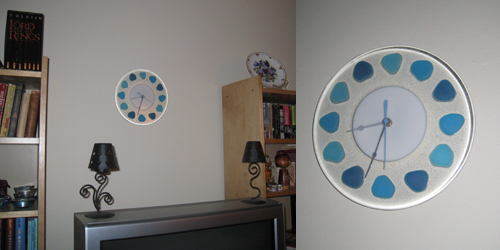 This clock was made by fusing the small blue pieces of glass to the large clear piece. The blue pieces were then sand-blasted to give them a matte look. 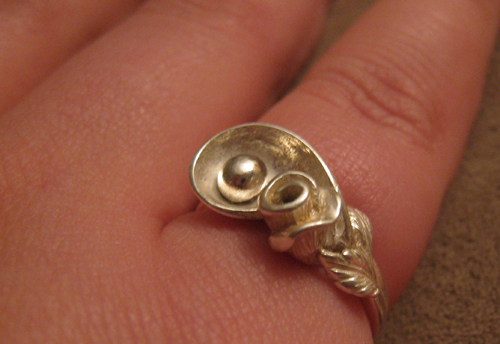 And a silver hand-cast ring from Redearth Spirit Jewellery‘s Gloria Valencia. It is drop dead gorgeous! I fell in love with the swirl and the silver-pearl and the little rose with leaves down the band as soon as I picked it up. Unfortunately, when I tried in on on Thursday, it didn’t fit, so I put it down and walked away. I went back to Gloria’s booth the next day to talk to her. I wanted to see if it would be possible to stretch the ring just a half-size or something. I figured my ring size was an 8 and it was just a little too snug and wouldn’t go on my finger all the way (I need to wear it on my ring finger on the ‘wrong’ hand). On Saturday (November 27), my knitter friend Vicki was participating in the Steveston Craft Fair. I wasn’t expecting it to be so huge and we certainly didn’t allot enough time to properly see everything. Rachel, who went with me, was just browsing, but I had a list. 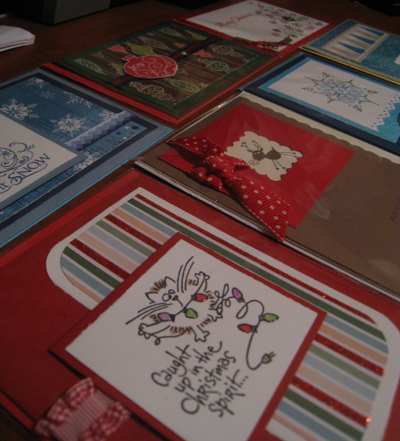 I wanted to get handmade Christmas cards for specific people (as I knew I’d not have enough time to make any myself). I was so happy to find The Cat’s Meow Greeting Cards. Such cute and lovely designs. Also, she was having a 2-for-1 sale in the last hour of the craft fair! My only complaint is that I didn’t have any milky pens to write on the darker-based cards (the inside is too dark for black pens). This weekend is jam-packed with craft fairs too. I still have a number of people to shop for, and several home décor items for the new apartment.Also on Saturday I’m going to Vancouver’s inaugural German Christmas Market downtown. The craftiness continues next week(end) too: One-of-a-Kind Vancouver is on from December 9-12 where I’ve signed up for a free sewing salon, and Shiny Fuzzy Muddy 11 on December 11 & 12. Sounds like you had fun and got some nice goodies, too! Always makes for a great day, eh? Beautiful cards, ring, and love that clock! !